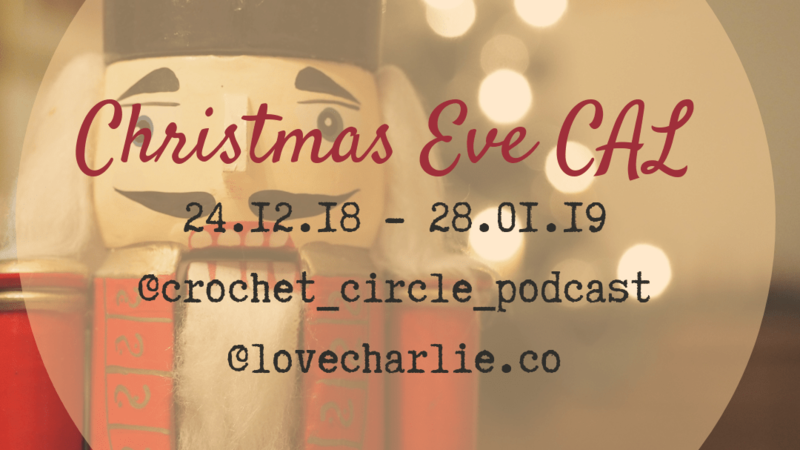 So its that time of year again… We’re almost done running around like headless chickens, faffing around with Holiday preparations, and all we really want to do is sit down and crochet (or knit, or spin, or weave or sew… you get my point) This year, Fay @crochet_circle_podcast and I are hosting another Christmas Eve CAL. Crochet along… Craft along… your choice 🙂 Any yarn related craft is welcome. A Christmas Eve CAL is where you start a new project using yarn that you’ve saved for a special project or received for Christmas. The trick is to let your loved ones know that you want to open any yarn presents a day early 😉 It is important to take a moment for yourself over the festive period, whether you have time off work or not – after spending the past weeks, if not months preparing gifts and handmade presents, buying, cleaning, tidying, wrapping, cooking and baking – Everything should be finished with and out of the way (unless you’re like me and still have presents to make in January) After working so hard, we all deserve some yarny, squishy goodness. The CAL starts on Christmas Eve, and if you’re very excited to start a new project you can stay up and start 1 minute past midnight. I did last year, and I might try to do the same this year. The CAL will be taking place across Instagram and Ravelry. Use the hashtag #ChristmasEveCAL on Instagram so we can see your makes, and follow the hashtag so you can make new friends and see what everyone else is making over Christmas. Chatter and FO threads are over on my Ravelry group… Click here for the Chatter Thread, and here for the FO thread. So what projects will you start? I’ll be working on two projects for myself over the Christmas break. One of them I have already started – I started on Thursday evening at woolgathering. A new pair of socks using Vicki Brown sock yarn in Hendricks and Flamingos. I am in living for these colours and I am love how my project bag matches. I also treated myself to a pin from Sharon @mycrochetmakes and it matches perfectly; as though the three were made for each other. I am making contrasting toes, cuffs and heels, using @Winwickmum‘s basic sock pattern. The main colour is Hendricks, and the contrast will be Flamingos. I will then be able to make a pair using Flamingos as the main colour. But this isn’t my ‘real’ Christmas Eve project. On Christmas Eve, I will be starting Arria by Fay. I will be using Riverknits yarn in Eve’s Birthday. (Just a coincidence) This project has been in my queue for a while, and what better time to start than a time when we have time to rest and relax. I am really excited about starting. The yarn I have for this is beautiful! And I chose colours that didn’t contrast so much as I want the triangle feature to be subtle. I can’t even begin to describe how pretty this colour way is, the photo really isn’t doing it justice. I can’t wait to see what you will be making. Please share on Ravelry or Instagram 😀 I also can;t guarantee that I will not start another project over the Christmas break. Hahaa, I can’t control myself. I will be writing a blog post soon sharing some of our Christmas traditions, and some of the things I like to do at Christmas time. I don’t know whether it will be before or after Christmas, so have a lovely holiday everyone. 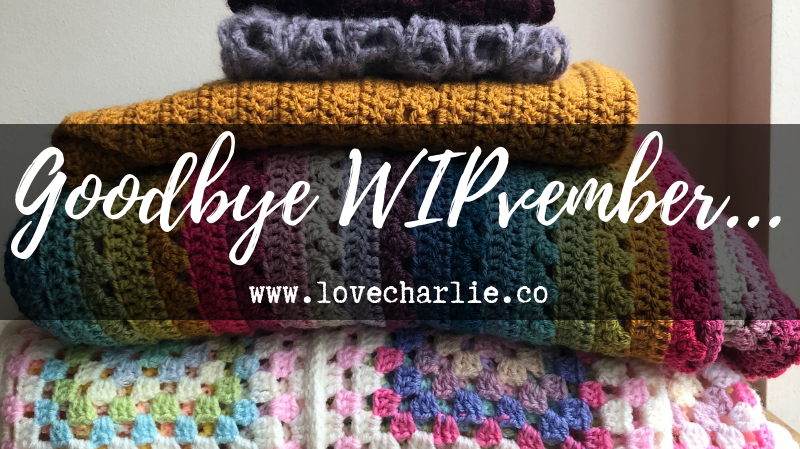 Have you got a never-ending pile of WIPs? Do you keep picking up new projects to start before finishing another? Have you got to make gifts for Christmas? 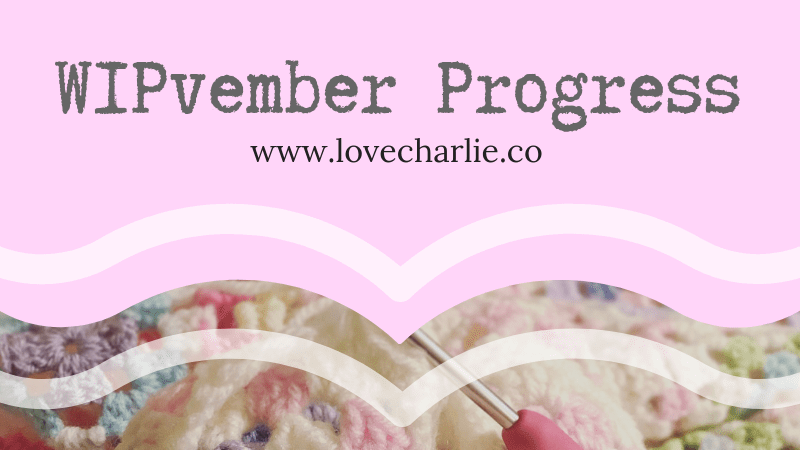 Do you crochet or knit and want to make some progress? Do you enjoy taking part in CALs, KALs, MALs and finish-alongs? Are you ready to be honest about how many half finished projects you have? Where is #WIPvember taking place? So, the finish along is taking place on Instagram, and starts on the 1st November, when we will share our ‘I’m joining’ badges which you can share too to let people know you’re taking part. How will we know what you’ve shared? 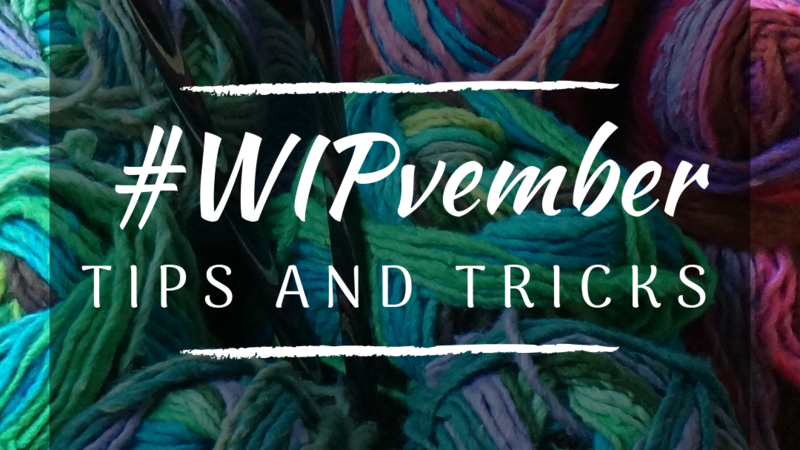 Well you can use the hashtag #WIPvember on your WIPs and FOs throughout November we will pick up on your posts. Feel free to use any other hashtags you like, but this is the hashtag we will be following. Following a hashtag on Instagram is great fun as any posts with the hashtag will appear on your feed. (Just search for WIPvember and select tags underneath the search bar – then click #wipvember and click follow) It is a great way of meeting new people and making more crafty friends. Also, you can help encourage other WIP-aholics on this challenge by sharing your own knowledge and advice. I can’t wait for the finish-along to get started, I have many WIPs and I’d like to get a few finished before the end of the year. I also need to make a few gifts for Christmas, and if I have time, I’d like to make a few decorations for the tree. I’m also looking forward to seeing how many WIPs other people have, and whether I am normal in having my excessive list. 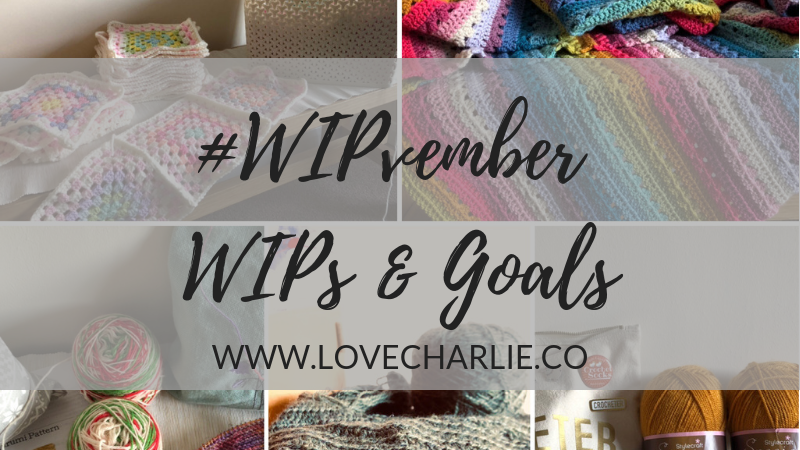 In my next blog post, I will be sharing some advice on how to set your goals for WIPvember.